Lately SL really played bad tricks on me and decided I am not longer allowed to snap pictures with shadows. As soon as I try to enable shadows and lightnings in my graphic preferences all viewers just crash. Anyways if I use my laptop or my PC – both worked fine with shadows about a week ago – anyways wich viewer I use… no difference. To ask for help and maybe get a solution for this new and weird problem I never had before I asked in Starwalkers 2010. All suggested things did not wanna work and I was really short before just getting depressed as Lovely entered my IMs and offered a very kind and generous thing. She asked me if she could help me with snapping, as she has no issues to snap with shadows enabled. I stared at my IMs not really believing what she just offered. I know Lovely for a while and I know her skills, if it comes to Photoshop and taking pictures and as well I can imagine, how much work it takes to make such pics. But she seemed to be serious and asked me for a TP. Lovely was really cute and we had fun doing pictures of different styles. 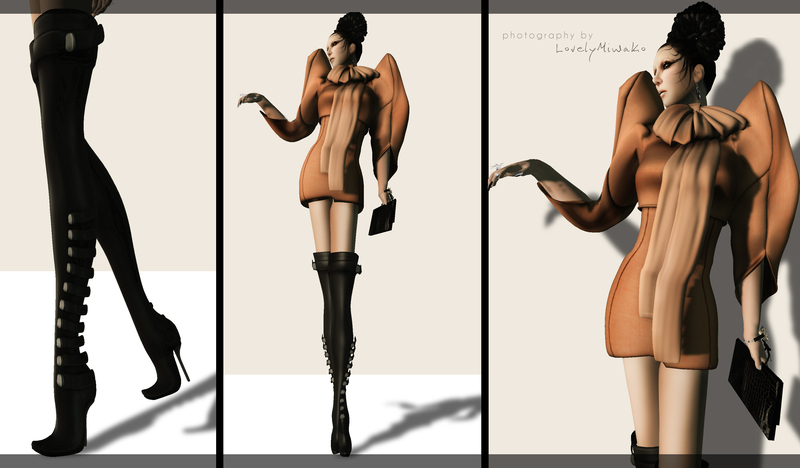 The first one she finished was the one of the new Diram mesh dress called “Brigitte”. I chose the saumon color as I really liked the harsh combination of black with a lighter color, so that the dress pops out even more. The “Brigitte” purse, as well comes from Diram and it matched perfectly to the whole look and even gave a light elegant touch to the whole style for me. The boots are one of the latest mesh releases from Miamai, called “Karya” boots and the “Tizia” hair comes from EMO-tions. This entry was posted in Fashion, New Releases and tagged 3D, 3D people, Art, avant garde dress, avatar, Blog, Blogger, Casual, Clothing, Couture, Diram, djod Karu, Elegant, EMO-tions, eMotions, Fashion, Fashion in Pixels, fashion poses, Female Clothing, female wear, Formal, formal attire, Formanails, Hair, High Fashion, Jewelry, Lovely Miwako, mesh, mesh boldero, mesh boots, mesh dress, meta virtual, Miamai, Model, model pose, Model Poses, Modeling, Modeling pose, Modeling Poses, New, New Release, New Releases, News, photographer, Pose, Second Life, Secondlife, SL, SL Clothing, SL Fashion, SL Style, Style, Virtual World, Wicca Merlin, woman. Bookmark the permalink. Great pics and style wicca! I have problems enabling shadows on my macbook pro laptop..I can only do it on my pc desktop so I switch back to my mac when I need to edit it on PS and yes editing eats up a lot of time!